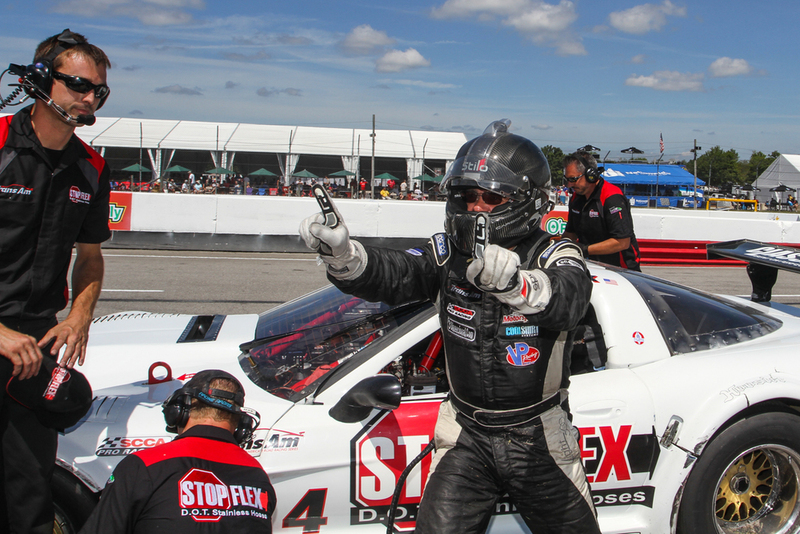 Winner Paul Fix sensed that contact lie ahead at Mid-Ohio so he sat back and let the race come to him. Making a one-time appearance, Tomy Drissi, (sponsored by new movie Straight Outta Compton) qualified his Tony Ave Corvette on the pole. Called in earlier for a stop-and-go penalty, he apparently “lost it” and wrecked the leaders on lap 23 of the 44 lap race. Drissi was stripped of points and not scored in the results. (In the Xfinity race, through no fault of his own, Drissi ran into a spinning car in his Straight Outta Compton NASCAR Cheve Camaro turning his Mid-Ohio foray into a nightmare). Amy Ruman qualified 3rd, took the lead and might have won. After the Tomy Drissi incident her crew got her running, led by Mike Edmunds. Finishing 26th at her home track had to be disappointing. Doug Peterson was following Ruman in his Tony Ave Corvette (re-bodied as a Cadillac by Advanced Composite Products) and was out of the race. Jim MacAleese and Adam Andretti passed John Baucom’s Mustang in the final laps to score season high 2nd and 3rd place finishes. Gregg Pickett, a mid-70s Trans Am winner in a Greenwood built tube frame Corvette returned in a Ford based Jaguar XKR. Next Race is Road America Aug 29.